After the poor sales for the underrated Outer Limits, Voivod frontman Snake left the band in 1994 to focus on a new project, and replacement Eric Forest was hired as frontman and bassist. Thus starts the band’s fallow 90s period that all Thrash acts seemed to go through, although the difference between Voivod and most others is that the Canadians’ step sideways didn’t put their musical talent into abeyance, it changed it. Moving from warm prog to cold industrial, Negatron is a cast-iron beast of an album, bleak and oppressive, heavy and crushing with barely a breather. It’s less atmospheric than the following Phobos, preferring to bludgeon the listener into submission, and fittingly Forest’s voice is more of a terrified shriek than Snake’s sneery singing. Although it takes a little while to get used to, he was about as good a replacement as it was possible to get. The stars of the show, however, are without a doubt guitarist Piggy and drummer Away, whose contributions just about save this album. Negatron is best summed up as something like the band’s older thrash days mixed with Ministry-esque industrial metal, songs full of riffs that are more upfront than Piggy’s normal fare, but serve to work as aggressive pounders. Opener Insect stomps in and never leaves, Forest’s yelling taking much of your attention despite Piggy’s sterling work underneath, a little repetitive but as intense and compelling as ever. It channels that aggressive thrash into an industrial framework that is effective despite lacking that genre’s usual whistles and bleeps, instead using a distant futuristic voiceover and bleak urban heaviness. Ironically, this serves to date the album as a creation of the 90s far more than the equally futuristic offerings of the band from the 80s. Yet compare this to the likes of Anthrax’s Stomp 442 and the difference is clear; Voivod still very much have an artistic vision that they are pursuing, and updates in sounds to fit in with their surroundings come a distant second to that. You can hear this clearly on tracks like Project X, in terms of riffage quite similar to The Outer Limits with just Forest’s aggressive vocals to really distinguish it. Sadly, the whole album doesn’t work as well as its best moments. Nanoman comes over as a simplified, dumbed-down version of the band’s style, much closer to Ministry than Voivod, and as much as I love Al J. and co, this isn’t what Voivod should be doing. Mildly catchy vocals above endlessly repeated riffs may work well for a few minutes, but at over five this is pushing things too far, especially with the notable dips into Alt Metal that come around the chorus. Fortunately, the following Reality pushes things back towards space-thrash a little, although by now if you aren’t starting to find Forest’s yelp even a little annoying then you’re a stronger person than I. Again, the length of tracks is also a nuisance – the title track has no need to be seven minutes long, and the drop into quieter, more atmospheric moments help the genuine thrash part to feel more out of place. This is a hard record to love, given Voivod’s near-flawless history. None of the killing songs mentioned below have anything near the power and greatness of previous album highlights from the band, without a doubt. The riff progressions on relatively great moments here, like Planet Hell’s quirky psychedelic morass, will impress if you’ve never heard Voivod before, but fans know that they can do much better. Still, that doesn’t mean Negatron is without any redeeming features. Meteor’s speedy rumble is enjoyable in a way that feels like it could have come from one of the band’s chaotic very early albums, and the slow-paced Cosmic Conspiracy starts like some long-forgotten Melvins dirge and ends in genuinely interesting prog-thrash style. Album closer DNA (Don’t No Anything) is a triumph, too, melding electronica into the mix and sounding like something from deranged Australian Industrial mentalists The Amenta as a result. You’ll also notice that I’ve listed more than a couple of songs in that killing songs section. In the right mindset, they truly are killing, harshly effective unremitting bursts of futuristic metal from a band with a constantly experimental mindset. 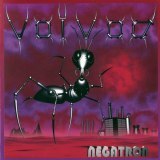 This might not be your or mine favourite Voivod album, but neither of us can deny the progressive drive of it, the hunger for some new facet of their many-sided sound to explore. It belongs in the collections of fans not so much for the music itself, but because of who made it, and there aren’t many bands that you can say that about. Give it a chance because it has the Voivod name on it, and appreciate it for what it is – an interesting if flawed exploration of industrial metal.